OK, I’ll fess up. None of the ratings agencies has yet formally downgraded France. But the Planet Ponzi Ratings Agency (established Nov 4, 2011) has formally rated France at A+. Given that we’re a newish agency, we’ve struggled hard to find the positives. And, um, they’re there all right. France makes nice wine. It has good beaches. It’s got some lovely cathedrals, chateaux and villages. The country has some excellent firms and a highly productive workforce. It’s just that government debt is high. The deficit is serious. Unfunded pension liabilities are a terrifying problem. And the market is not lending to French banks. Read that sentence again. French banks have basically been cut off from their normal sources of funds. American money market funds have mostly withdrawn from the market. Other banks are becoming increasingly suspicious of the French financial institutions. Naturally those French banks and the French government deny any problem. Just like the Greek government denied it had a problem. Like the Irish and Portuguese governments did. Like Italy and Spain did. Like Gordon Brown did in Britain. Like the authorities did in the US up until the Lehman implosion. Like Merkel and Sarkozy – the Denial Twins – have done all through these last couple years. Naturally, there have been stress tests for the banks – but the ones we’ve seen so far haven’t even considered any haircuts for sovereign debt they hold, even though that sovereign debt has been massively impaired in value. So those stress tests are meaningless … except in one way. You wouldn’t run meaningless stress tests unless you wanted to avoid a truthful result. And that must mean you’re trying to shelter someone or something. Someone or something with enough influence in Europe to shape the way these things are done. That someone or something must have to do with either France or Germany, the only two Eurozone countries with real political clout. And Germany is fine. 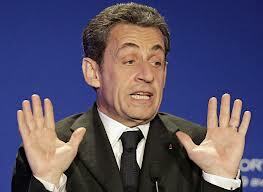 So Monsieur Sarkozy, je vous accuse. The Planet Ponzi Ratings Agency’s first news announcement has France at A+. And the outlook is negative.